Black and white is a classic combination. In interior design, black is as dramatic as it is couture. Think of classic Audrey Hepburn – the little black dress, the perfect pair of high heels, the quilted black Chanel bag or the sporty black slim pants. Casual to dressy, there isn’t anything that doesn’t look good in black. And the same goes for interiors. To some, black may seem to be the most somber color, but it also can create definition, lend a striking contrast and provide an anchor in a room. The elegance of black in an interior creates a sophisticated feel with even the most minimal accents. Black has a way of showing up in the most traditional rooms to the very contemporary. 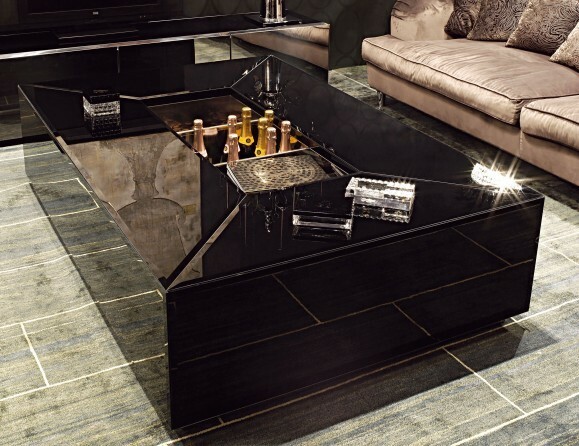 Black lacquer coffee tables and side tables work well in contemporary interiors because of their elegance, simplicity and unobtrusiveness in a room. The sleek and sophisticated appeal of black is also very dramatic in granite, tiles and other hard surface materials. One of my favorite spots to shop is the Ralph Lauren store on Chicago’s Michigan Avenue, aka The Magnificent Mile. The home furnishings department is always my first stop. Last December, it was decorated beautifully for the holidays, but what stood out was the brilliant use of black suede fabric covering the walls in one of the vignettes. I had to touch it to make sure it was really what it looked like. Accented with white molding, bold plaid fabrics and a very gutsy leather sleigh bed. It was contemporary chic holding hands with traditional handsome elements. The classic combination of black and white never goes out of style. Tweed, houndstooth, and , and graphic patterns in black and white are showing up everywhere in the showrooms. These 1930’s and 1940’s designs are modern, compelling and back in vogue. Fortunately, black and white provide the perfect background for another color. For instance, mix black and white with red for an unbeatable knockout punch. In a black and white bathroom, for example, add bright yellow accents or towels. For an upscale French Country look, use elegant black and white striped fabric, or toile on draperies and upholstery. It’s a sure winner.